These warm, waning days make me crave bright, fizzy drinks. Thankfully it's not yet time for mulled cider and the heavy bevs of autumn. The cukes are getting fat on the vines. Gotta use them up. 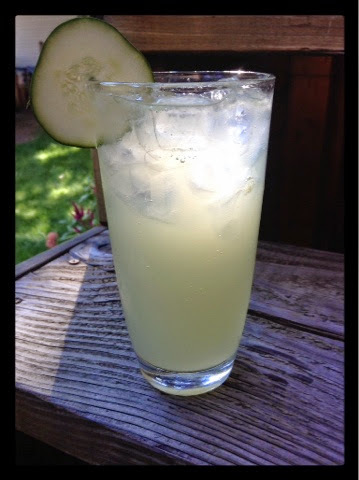 Here's a recipe for a refreshing cucumber shrub that makes a great base for a soda and also likes to be paired with gin or tequila for a boozy alternative. One large cucumber sliced thin. 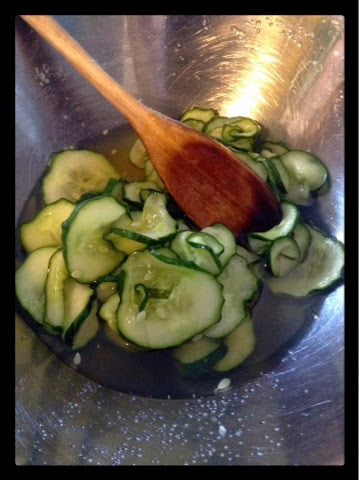 Green cukes will make a pleasant, pale jade syrup. But use what you've got. 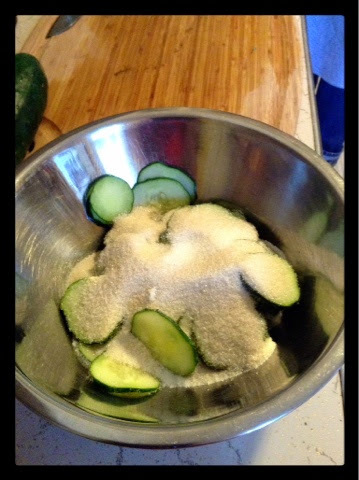 Place cukes in a bowl and stir in 3/4 cup sugar and 2 tsp. salt. Mix well and cover. Let sit at room temperature for at least an hour, stirring occasionally. The cukes will give up a lot of juice. Pour mixture in a blender and purée with 3/4 cup vinegar of your choice. I used organic cider vinegar. Strain puréed ingredients through a fine mesh strainer, squeezing pulp to remove juice. To make a refreshing soda, combine syrup with soda water to taste and serve over ice. Garnish with a fresh round. If you really want to forget that winter is waiting in the wings, mix equal parts shrub with tequila or gin. Add ice and soda water to taste and finish with a sqeeze of lime.